Can I use ordinary paper for Decopatch? Can I use wrapping paper, tissue paper, newspaper, magazines? Can you decopatch with photos? The answer to these questions is 'maybe'. The box below was decoupaged with ordinary paper from a desk calendar. Click here for a step-by-step guide. 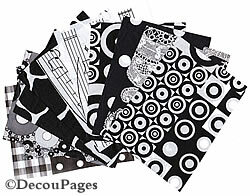 Decopatch papers have been designed to be thin and flexible yet strong. Ordinary tissue paper may be too fragile and disintegrate as you try to glue it in place. It may also wrinkle as you try to stick it down - although this can add character to the design. Thicker paper and photos will leave a noticeable ridge at the edges. This is why traditional decoupage uses many layers of varnish and repeated sandings to achieve a smooth finish. Using a copy of photographs printed onto standard paper rather than photographic paper may give better results. Ordinary paper may not be flexible enough to wrap around uneven 3D shapes without forming wrinkles. Unlike Decopatch paper, the colours from tissue paper, ordinary printed paper, newspaper or wrapping papers may bleed. If you are using paper that is printed on both sides it may show through on the front. If you want to use something other than Decopatch paper, test it out first. How much Decopatch paper will I need? 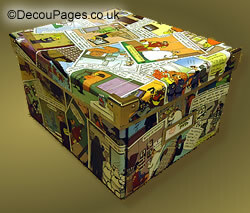 As a generous estimate, allow enough Decopatch paper to cover or wrap the object plus half as much again. The more you overlap the pieces the more paper you will use. How do I clean Decopatch glue and varnish off my Decopatch brushes? Do I need to prime MDF or paper mache Decopatch blanks before Decopatching? 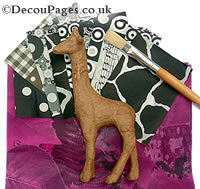 If you are only using dark papers then you may get away without priming your Decopatch blank. But, the brown colour of the un-primed blanks tends to show through white and other pale coloured papers, although you may like the effect. Priming your blanks before Decopatching ensures light colours won't be 'toned down' by the MDF or paper mache colour underneath. Painting your blanks with a light coat of white primer will ensure the brightest colours on your finished piece. 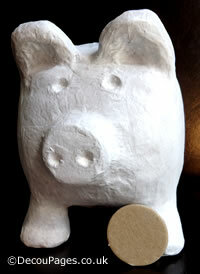 The photo shows a piggy bank with its as yet un-primed belly button. It shows the difference a coat of gesso makes. Decopatch white acrylic primer (sometimes referred to as acrylic gesso primer) is ideal for priming MDF blanks. It's water based and solvent free. Is Decopatch suitable for children? Yes, with proper supervision. Decopatch glue-varnish is non-toxic and water based. See our page on Decopatching for Kids. Why does my finished Decopatch project feel tacky / sticky ? The problem is often encountered when you have Decopatched a non-porous surface such as plastic, glass or metal. The layer beneath the paper may not have dried fully before the top layer of glue-varnish has dried, so there is soft layer beneath the dry surface . The problem often sorts itself out after a few weeks. If not, you can reduce the problem of tacky or slightly sticky Decopatch / decoupage objects by coating them with a layer of Decopatch varnish or an acrylic sealer. To reduce the problem on future projects, use less glue-varnish on non-porous surfaces than you would on porous / absorbent surfaces.